Cologne Cathedral is dedicated to St Peter and the Virgin Mary and follows the pattern of the High Gothic cathedrals of northern France. It is richly articulated but a little stiffly executed. There is an almost scientific perfection about the design, and the craftsmanship is precise. The cathedral is 144.6 meters long and about 45 meters high. The ground-plan, although strongly influenced by that of Amiens Cathedral, has some unusual features. 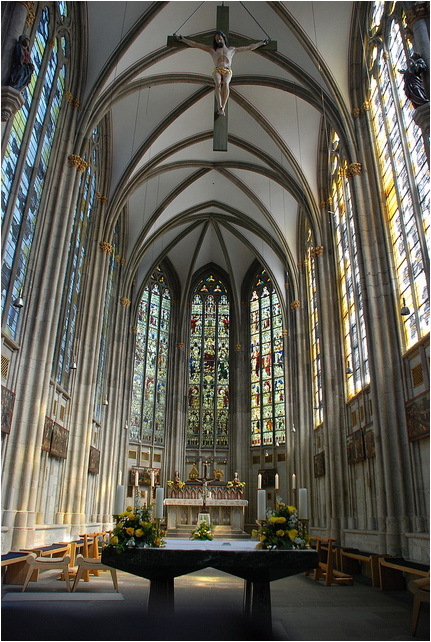 Both the eight-bay nave and the four straight bays of the choir were planned with double aisles, the outer aisles being rather narrower than the inner ones. Each arm of the transept has four bays, with east and west aisles. The west towers are each built over four aisle bays, so that they are considerably wider and deeper than in French buildings, and there is an enormous increase in their total height. The chevet has an ambulatory with seven radiating chapels, and there are quadripartite rib vaults throughout. The elevation and cross-section also largely correspond to the Amiens model, but in Cologne the vertical architectural members are far more slender and numerous. The arcade piers are moulded, with comparatively small foliage capitals, and the vault shafts rise without interruption to the springers. The glazed triforium and clerestory are linked by continuous mullions, with four lights in the straight bays, the triforium openings being further subdivided. The total height of the elevation is almost the same as that at Amiens, but the triforium is placed somewhat lower down, so that it occupies the exact centre of the elevation on a 3:1:3 ratio. Other clear parallels with Amiens include the tracery patterns of the choir clerestory and chapels, and the pierced parapet, gabled windows and heavily traceried flying buttresses. The 4 meter high parchment drawing of the design of the west façade provided guidelines for the 19th-century builders. The lower third of the façade reflects the disposition of the nave and aisles. The lower parts of the towers are quadrangular, but they change to octagonal above. The openwork stone spires terminate in enormous finials. 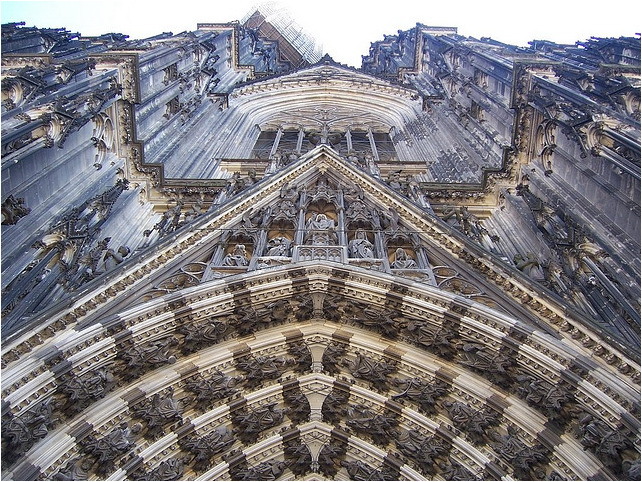 There were no such medieval guidelines for the transept façades, which were designed afresh by the cathedral architect Ernst Friedrich Zwirner. They are based on the design of the west front and are among the most important works of the Gothic Revival. From 1880 to 1900 mosaic flooring made of ceramic material was laid in the choir. The figurative scenes, made in Mettlach after designs by August Ottmar von Essenwein, have mythological and allegorical themes.